Well, it has been waay to long since my last post. I am very sorry about that. I have been super busy lately. But rest assure I am still hard at work creating my tropical paradise. I have been given a gift from a dear friend of mine yesterday. She picked this little gem up at a plant sale over a year ago. I was at her house when I saw it. 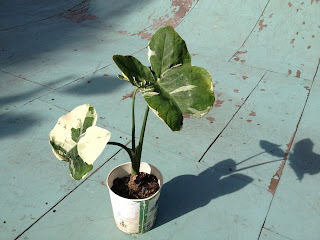 It was a Variegated Elephant Ear ( Colocasia esculenta 'Elepaio' ). I have never seen one before and I instantly fell in love. I asked her to break me one off when it began to throw pups and she replied " No problem". Well to my surprise her son hand delivered it to me yesterday. To be honest , it was over a year ago since I have seen this Variegated Elephant Ear and I had completely forgotten about it. So you can imagine my surprise when it was handed to me. That made it extra special to me. I will take extra good care of this one! The Variegated Elephant Ear ( Colocasia esculenta 'Elepaio' ) can survive in sun to shade conditions and is a tropical plant. It is a rare Elephant Ear that is named after the rare Hawaiian fly catcher bird 'Elepaio'. This tropical plant requires consistently moist soil which makes it great for bogs and water gardens. I hope you enjoyed my post. See you again next time!! I just wanted to take a moment and tell you about my favorite seafood market. Pelican Seafood Company in Fort Pierce Florida is hands down the best seafood market around. They have been in business for 30 years serving our community with the freshest seafood around. Established in 1982, this locally owned and operated seafood market is as good as it gets. They have fresh fish,SMAK, scallops, mussels, clams, oysters, lobster, shrimp and much more. Those stone crabs make my mouth water!! Now that's a nice spread!! Salmon, Swordfish, Mutton Snapper, Flounder, Cobia, Tuna and more!! Aside from their exceptional customer service Pelican Seafood Company ships!! That's right! You don't have to live here to enjoy the fresh seafood that Pelican offers. I really suggest you give them a shout next time you get urge for some fresh seafood!! See you again next time! !